Strive Publishing’s vision is to be the leading publishing company in providing contemporary African American stories. We will begin by filling the need for picture books and young adult novels that our children can see themselves in and will work toward filling the need for African American adult representation in other genres. Through publishing and illuminating the stories of creativity, wonder, determination, and success of generations of African Americans, we will help tear down stereotypes and build up bridges that connect to a more diverse publishing industry. Based in Minneapolis, Minnesota, Strive Publishing exists to help solve two problems: the need for culturally relevant children’s books and the underrepresentation of African American authors. While giving all children the opportunity to see African American culture from different perspectives, Strive Publishing aims to create opportunities for emerging African American authors. We all have a stake in the critical work of getting books by and about African Americans into the hands of all children, and we can make the greatest impact by working together. First Place: $1,000 cash prize, a T-shirt from Strive, a tote bag from Free Spirit, and a meeting with Mary Taris, founder of Strive, and an editor from Free Spirit to discuss the winner’s project. The winning submission will be seriously considered for publication by Free Spirit, cobranded with Strive; however, publication is not guaranteed. Title the manuscript and include your name on each page. Winners will be notified by email on or around September 2, 2019. All potential winners are subject to verification. Each prizewinner may be required to sign and return to Sponsor, within ten (10) days of the date notice is sent, an affidavit of eligibility/liability and publicity release (except where prohibited) in order to claim their prize if applicable. If a potential winner of any prize cannot be contacted, fails to sign or return the affidavit of eligibility/liability and publicity release within the required time period, the prize or prize notification is returned as undeliverable, or the potential winner is deemed ineligible, the potential winner forfeits prize, and Sponsor will award the applicable prize to an alternative winner selected from all remaining eligible entries. Upon confirmation of eligibility, prizes will be awarded no later than October 31, 2019. Prizes will be awarded in accordance with these Official Rules. Sponsor’s determination of eligibility and selection of winners is binding on all participants. The total number of prizes is three (3). The total prize value for all three (3) prizes is $1,750 in cash plus merchandise listed in the prize descriptions. All prizes will be awarded in connection with this Contest in accordance with the Official Rules. Within approximately thirty (30) days after confirmation of the winners, Sponsor will provide the winners with their prizes (e.g., check, gift certificate, or other document giving winner unconditional right to receive the respective prize). All prizes are nontransferable and nonassignable, and noncash prizes cannot be redeemed for cash. All costs, fees, expenses, and taxes (including, without limitation, federal, state, and local taxes) associated with any element of a prize are the sole responsibility of the winners. Everyone who enters the contest has the chance at publication. A Winners List will be posted at freespirit.com/contest and strivepublishing.com after winners have been notified. The Contest begins at 7:00:01 a.m. (CST) on March 15, 2019, and ends at 11:59:59 p.m. (CST) on June 30, 2019 (“Entry Period”). Mailed entries must be postmarked, and emailed entries must be received, by 11:59:59 p.m. CST on June 30, 2019. No manuscripts will be returned. Entries that do not conform to contest rules will be disqualified. By entering this Contest and in consideration for the same, the three selected winning Entrants grant Free Spirit Publishing and Strive Publishing an irrevocable, exclusive, fully paid license to use, publish, and distribute the winning Entrant’s Contest submission and all content submitted in connection therewith. Winning Entrants agree to sign documents deemed necessary by Sponsor to confirm and document the license. The license granted pursuant to this paragraph does not divest Entrant of ownership of the Contest submission. By participating, Entrant agrees to waive, release, hold harmless, and indemnify Strive Publishing and Free Spirit Publishing Inc.; their current and former officers, directors, owners, employees, agents, representatives, affiliates; and the judges (“Released Parties”) from and against any and all liability or causes of action (however named or described) and for any injuries, losses, and/or damages caused by or resulting from entry or participation in this Contest, including without limitation: (1) any incorrect or inaccurate information, whether caused by Entrants, any Released Party, printing errors, by any of the equipment or programming associated with or utilized in the Contest; (2) technical failures of any kind, including but not limited to malfunctions, interruptions, or disconnections in phone lines or network hardware or software; (3) unauthorized human intervention in any part of the entry process or the Contest; (4) technical or human error that may occur in the administration of the Contest or the processing of entries; or (5) any injury or damage to persons or property that may be caused, directly or indirectly, in whole or in part, from Entrant’s participation in the Contest or receipt or use or misuse of any prize. If for any reason an Entrant’s entry is confirmed to have been erroneously deleted, lost, or otherwise destroyed or corrupted, Entrant’s sole remedy is another entry in the Contest during the Entry Period. Released Parties are not responsible for any expenses incurred by Entrant in connection with participation in this Contest. Winner(s) agrees to allow Sponsor to use their submitted title(s), name, likeness, picture and/or hometown and state information for promotional purposes in all media, worldwide, as may be determined by Sponsor without additional compensation. Winner(s) agree to sign documents deemed necessary by Sponsor to confirm permission and authorization. Entrants agree to be contacted by Sponsor, including via email, in the future (and shall have the opportunity to “opt out” of such emails). Sponsor reserves the right to modify any term of this Contest and these Official Rules at any time at Sponsor’s sole discretion. Sponsor reserves the right to cancel, suspend, and/or modify the Contest, or any part of it, if any fraud, technical failures, or any other factor beyond Sponsor’s reasonable control impairs the integrity or proper functioning of the Contest, as determined by Sponsor in its sole discretion. In such event, Sponsor reserves the right to award the prizes from among the eligible entries received up to the time of the impairment. This Contest shall be conducted in accordance with the laws of the State of Minnesota. All disputes concerning these terms and Contest shall be adjudicated in the federal and state courts having jurisdiction over Hennepin County, Minneapolis, Minnesota, USA. The Sponsors of this contest are Free Spirit Publishing Inc. (www.freespirit.com) and Strive Publishing (www.strivepublishing.com). As used in these Rules, “Sponsor” means Free Spirit Publishing Inc. and Strive Publishing collectively. Administrator of this Contest is Free Spirit Publishing Inc., who can be contacted by calling 612-338-2068 or emailing contest@freespirit.com. Any attempt to enter this Contest in a manner other than in compliance with and as provided in these Official Rules shall be VOID. Entries received from persons not meeting eligibility requirements will be disqualified. Sponsor is not responsible for lost, late, incomplete, invalid, unintelligible, or misdirected entries, all of which will be disqualified. NO PURCHASE NECESSARY. A PURCHASE WILL NOT INCREASE YOUR CHANCES OF WINNING. 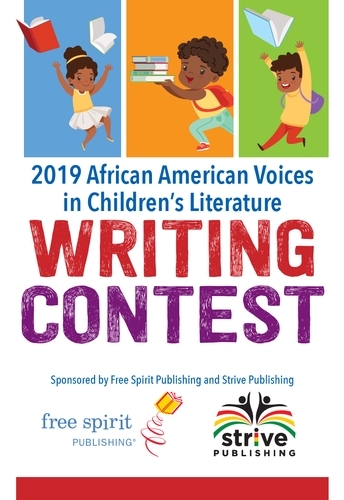 The 2019 African American Voices in Children’s Literature Writing Contest (“Contest”) is subject to all applicable federal, state, and local laws and regulations. VOID WHERE PROHIBITED BY LAW. Participation constitutes full and unconditional agreement to these Official Rules and Sponsor’s and judges’ decisions, which are final and binding in all matters related to the Contest. Winning a prize is contingent upon fulfilling all requirements set forth herein and is not guaranteed.